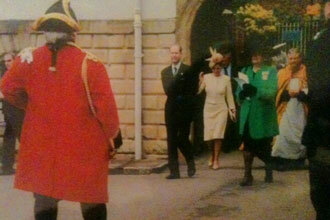 was my honour to welcome Prince Edward and Sophie, Countess of Wessex, to my home city of Gloucester last week. Their Royal Highnesses were visiting the city as part of the Diamond Jubilee tour and, during their afternoon here, took part in a thanksgiving service at the Cathedral. They were also presented with a gift from the City of Gloucester to the Queen – a Lamprey Pie.